The best-selling Audi A4 is a mid-size luxury sedan, with a spacious, impeccably designed and executed interior. Its adroit handling is finely balanced with its comfortable ride, and its fuel economy of 24/32 mpg is very good for its class. The Audi A4 is seen as the more dynamic alternative to traditional luxury cars and competes with the Infiniti Q50, the Mercedes-Benz C-Class, the Cadillac ATS, and the BMW 3-Series. The Audi A4 comes in 3 levels of trim, Premium, Premium Plus, and the high level Prestige. At the Premium level are leather upholstery, power sunroof, auto climate control, and, of course, power front seats. The Premium Plus trim level adds heated front seats with memory, heated mirrors, xenon headlamps with LED running lights and taillights. The Prestige trim level adds navigation, Audi side assist, adaptive headlamps, and a Bang & Olufsen sound system. The interior of the Audi A4 boasts an exceptional cabin design, impeccably conceived and finished with exemplary materials with gleaming aluminum or wood inlays. Everything in the interior laid out exactly right, and softly lit at night. Nappa leather upholstery is standard on the comfortable 8-way power-adjustable front seats and roomy rear seats. Optional Alcantara inserts and heated front seats are available, as well as sport seats providing even more support. The Audi A4 seats five passengers with a roomy 60/40 split folding rear seat, new for 2015, and 35.2 inches of rear legroom. The roomy front seats make it one of the best smaller sporty sedans for taller drivers. Road noise is quiet as expected in cars of this luxury class. The engine handily delivers a burst of power for highway passing and merging, and on curves the A4 feels balanced, secure and athletic with well-tuned steering and tight handling. Even in crosswinds, the Audi tracks straight, requiring very little effort to keep on course. The A4 achieves a good balance between responsive steering with strong braking and ride comfort. The all-wheel drive is adept in snow and rain, reflecting its heritage of racing over unpaved roads. Regardless of the road surface, smooth or bumpy, the A4 ride is stable, firm and solid, giving the feel of a larger car. The standard 220 horsepower turbocharged 2 liter four-cylinder engine is joined to a continuously variable transmission in the front-wheel drive models. Flooring the gas pedal just rockets the A4 up to redline, with no sign of power running out. Acceleration is strong enough to push you back into the seat cushions, with plenty of power to spare for highway passing. 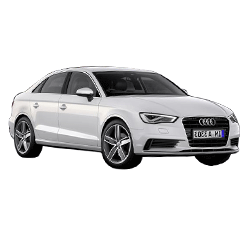 The Audi comes standard with XM radio, single CD, 10-speaker sound system, the Audi music interface includes a dedicated cable for iPod, and a 14-speaker Bang and Olafson sound system is available. The same Audi MMI infotainment system provides access to navigation and driving information, climate controls, and music. The MMI infotainment system provides one of the best GPS experiences with its optional LCD screen navigation showing Google Earth maps and Points of Interest and Google Maps Street View. Visual traffic congestion information appears via satellite radio. The MMI also provides Bluetooth streaming, Dual SD Card slots, and turns the car into a mobile WiFi hotspot. The Audi A4 standard safety equipment includes 8 airbags, electronic stability control and hydraulic brake assist for use with the anti-lock brakes. An optional rearview camera helps to spot obstacles behind the car when backing up, and optional rear side-impact airbags protect outboard rear-seat passengers in a side impact. Optional driver safety features include "side assist" which monitors the driver and passenger-side blind spots and notifies the driver if another vehicle poses a potential hazard. "Adaptive cruise control" automatically maintains a distance from a vehicle in front and will warn the driver if it detects an impending collision. Although the interior of the A4 cabin is well designed, there is a remarkable lack of storage space. Aside from a roomy glove compartment, additional storage space in the cabin comes up short. The trunk offers 12.4 cu-ft of luggage space, quite modest for a mid-size luxury sedan. Although the MMI is comprehensive and has a good interface, some find the infotainment system is hard to navigate with some controls nested deep within menu screens. It continues strong since it debuted in the 2009 model year. However, rumored updates to the A4 package may be in store for the 2016 model year. The Mercedes Benz C300 sedan like the Audi A4 has an elegant interior and a well-behaved ride. When equipped with all-wheel drive, the C300 gets better fuel economy than the A4, and the C300's turbocharged four-cylinder engine is quite lively as well. In the BMW 328i, like the Audi A4, outstanding handling and strong acceleration make it one of the most enjoyable cars for enthusiasts to drive, with good fuel economy as well. The 328i is seen to have a roomier rear seat. The Audi A4 all-wheel drive is strongly recommended, however, the front-wheel-drive Audi A4 is not as precise in cornering as a rear-wheel drive BMW 3 Series car. There is an overwhelming surplus of good points and very few negatives for the 2015 Audi A4. The A4 is one of the best luxury car buys that continues to satisfy on all fronts year after year. By pleasing its luxury seeking, technology savy, and driving enthusiasts, it is no wonder that the 2015 Audi A4 is among the best-selling of the midsize luxury sedans in America.